Hello Mechanical Engineer's we time to time bring latest Mechanical project idea and topic for you all. This time we have brought you some of the latest Mechanical designing and fabrication project idea and topic for you. If you need help regarding these projects then please leave your comment and we will definitely try to help you out. You can also Subscribe to FINAL YEAR PROJECT'S by Email for more such projects and seminar. 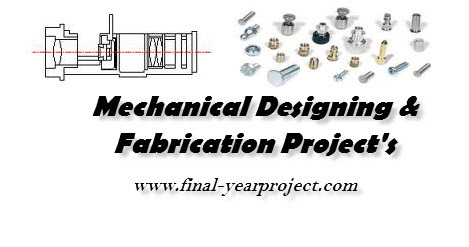 If you want more project report, topic for Mechanical Engineering then you can also Subscribe to FINAL YEAR PROJECT'S by Email.